This week, one of the world’s most celebrated cryptozoologist, learned zoologist, and authority on Vietnamese birds died on Tuesday, January 10, 2017 - Võ Quý at the age of 87. 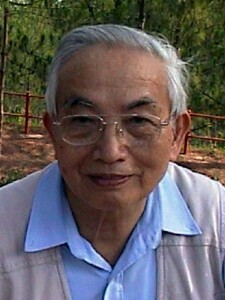 Dr. Võ Quý (born December 31, 1929) was a Vietnamese zoologist and professor at the Vietnam National University, Hanoi. 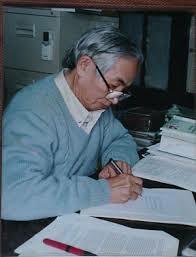 He was an ornothologist and was a recipient of the 2003 Blue Planet Prize. 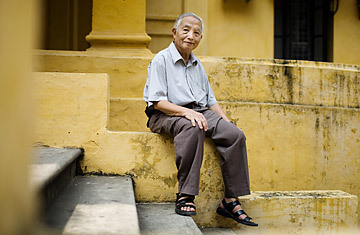 During the war against the French, he studied in China, but in 1954 he returned to Vietnam and helped to found the University of Hanoi. He researched the effects of defoliation by the United States in the Vietnam War, and the impact of the herbicides, including Agent Orange used on the environment. 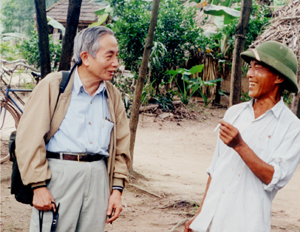 He helped to plan government reforestation programs. Dr. Võ Quý relocated the rare Eastern Sarus Crane, a species badly affected by the war, and helped to establish a treaty for the protection of migratory birds. 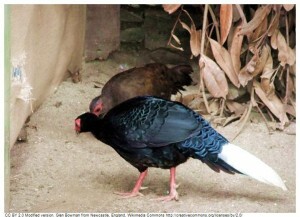 Võ Quý suggested that the Vietnamese pheasant (Lophura hatinhensis) was a different species from Edward’s pheasant (Lophura edwardsi), and has been credited as the 1964 discoverer of this new pheasant. Võ Quý wrote the two-volume book, The Birds of Vietnam, and co-authored The Kouprey: An Action Plan for Its Conservation. Birds of Vietnam by Võ Quý was the first Vietnamese-language guide to the birds of Vietnam, as well as to any fauna of Vietnam. Dr. Võ Quý’s cryptozoology involvement in his country has a long history, from the time of his early findings of new or rare birds, to discoveries regarding mammals. A North Vietnamese expedition involving Professor Võ Quý was sent to Kontum province of Vietnam, partly to investigate reports of “Người Rừng” (forest people). In the early 1970s, the war-torn border areas of Vietnam, Cambodia, and Laos had many reports of the Nguoi Rung, a hairy hominid. So frequent were the reports that in 1974, during the height of the Vietnamese War, General Hoang Minh That, commander of northern forces in the Central Highlands, asked for a scientific survey of the natives of the region north of Kontum, to ask them what they knew of the Nguoi Rung. Animal X Series Two: Episode 13 – Minnesota Iceman (1998) – Professor Vo Quy investigated numerous reports of ape-like creatures spotted in Vietnam during the war for the government. He says he met some US soldiers at an American base there. The US soldiers told him that in about 1965 a helicopter brought in a strange animal (like the Minnesota Iceman) and was taken to a Vietnamese city after a couple of hours being at the base. More about the Minnesota Iceman, here. 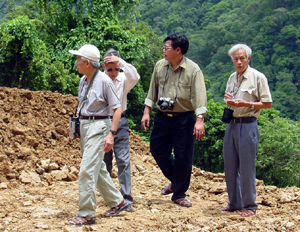 As I report in my 1999 book, Cryptozoology A to Z, scientists who were part of this dangerous expedition included Professors Võ Quý and Le Vu Khoi from Hanoi University and Professor Hoang Xuan Chinh from the Institute of Archaeology in Hanoi. 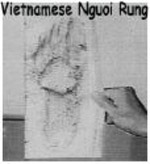 No Nguoi Rung were found, but Võ Quý found and cast alleged Nguoi Rung footprints. Furthermore, the expedition returned north with two new elephants. 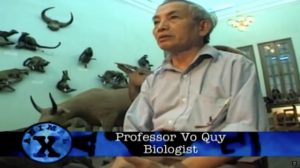 As I also noted in Cryptozoology A to Z, in November 1988, Hanoi University zoologist Võ Quý led a well-funded capture team to begin a kouprey captive breeding population, but specimens eluded him and his party. Koupreys remain one of Asia’s most elusive larger mammals, and is noted as a “classic animal of discovery” in cryptozoology. Võ Quý has been recognized by world organizations and media for his work with reforestation and other conservation efforts. “I know of no other Vietnamese natural scientist who has garnered such esteem for his efforts for a better World.” ~ Vern Weitzel, Chairperson, Australia Viet Nam Science Technology Link. Thanks to Vern Weitzel for this sad news.